The Hawker Tornado was the predecessor of the Typhoon and the Tempest. Above is the second prototype (P5224) with a chin type radiator. In 1938, two prototypes were ordered using different 24 cylinder, liquid cooled engines. The types would be labeled as the “N” and “R” type indicating the engine manufacturer. The “R” type would install the Rolls Royce Vulture X-24 engine, and would be known as the Tornado. The “N” type utilized a Napier Saber H-24 engine, and became the prototype for the more famous Typhoon. The most distinguishing difference between the Tornado and the Typhoon was the Tornado had two rows of exhaust manifolds on each side of the nose, and the Typhoon had one row of exhaust manifolds on each side of the nose. •	P5219. Prototype. Vulture engine with ventral radiator. •	P5224. Prototype. Vulture engine with chin radiator. •	HG641. Prototype. Bristol Centaurus C.E.4S radial engine with oil-cooler below the nose. •	R7936. Production aircraft. Vulture engine with chin radiator. The first Typhoon “N” prototype was P5212 with the Napier Saber engine with chin radiator. The second prototype Tornado (P5224) flew on December 5, 1940 and was also powered with a Vulture II engine and had a Rotol constant-speed propeller. Armament consisted of four 20 mm Hispano cannons. Both the first and second prototypes engines were upgraded to Vulture Vs, the designated engine for production aircraft. The first Tornado prototype (P5219) with ventral radiator. This aircraft was destroyed during testing. Production of both “N” and “R” types were developed in parallel, and the initial flight trials of the prototypes were promising, and a production order for 500 Tornados was placed at the beginning of November. It was proposed that the new fighter should be built both by Hawker and by A.V. Roe at Woodford. 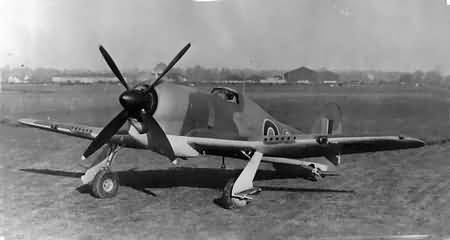 Meanwhile, on December 30, 1939, the first Napier Sabre engine had been delivered to Hawker Aircraft, and the first “N” prototype Typhoon (P5212) emerged from the experimental shop to fly on February 24, 1940. It received orders of 250, and would become the responsibility of Gloster Aircraft, whose assembly lines were emptying of Gladiator biplanes, despite its design office being already immersed in the development of the Gloster Meteor, the first British turbojet aircraft. The "X" form of the Tornado's Vulture engine had not permitted installation above the front spar as was the Typhoon's Sabre. In consequence, the overall length of the Tornado was 32 ft. 6 in. as compared to the Typhoon at 31 ft. 10 in. In May 1940, the grave war situation led to the cancellation of all priority for Typhoon and Tornado development in order to allow every effort to be put into the production of sorely needed Hurricanes, but design development was allowed to continue.4 However, during 1940, three alternative engine installations were proposed for the Tornado—the Fairey Monarch, the Wright Twin Cyclone, and the Bristol Centaurus—and experimental drawings for the Centaurus installation were completed. However, by October 1940, enthusiasm had been revived and production of the Tornado and Typhoon reinstated production deliveries of both being scheduled for the following year. Third prototype (HG641) with Bristol Centaurus engine was a test-bed for a number of Centaurus engine/propeller combinations. The oil-cooler duct led forward to the nose and twin exhaust exited aft through the duct fairing underneath the belly. In February 1941, Hawker would receive a contract for a third prototype to take a Bristol Centaurus C.E.4S radial engine. HG641 was assembled from two incomplete Tornado production airframes (R7937 & R7938), and flown for the first time on October 23, 1941. The first Centaurus installation had an exhaust collector ring forward of the engine from which a single external exhaust stack pipe that led back under the root of the port wing. This arrangement soon proved unsatisfactory, and the oil-cooler duct was enlarged and led forward to the nose, while twin exhaust pipes led back from the front collector ring through this fairing to allow exhaust gases to exit underneath the belly. A level speed of 421 mph was attained with the Centaurus-Tornado. 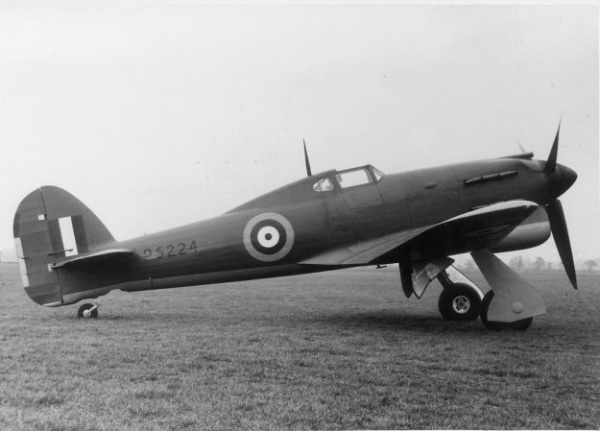 This aircraft would serve a test-bed for a number of Centaurus engine/propeller combinations and was the predecessor of the Hawker Typhoon II and subsequently the Tempest. The Tornado's empty weight was 8,377 lbs. and 10,668 lbs. loaded. Its maximum speed was 425 mph at 23,000 feet. A.V. Roe had prepared a production line at Woodford, and the first production Tornado (R7936) was flown on August 29, 1941. But this was fated to be the only production Tornado, for difficulties with the Vulture resulted in the decision to remove this power plant from the aero-engine development program. This decision also canceled production of the Avro Manchester. The sole production Tornado (R7936) later played a useful role as a test-bed for deHavilland and Rotol contraprops. 398 mph (641 km/h) for Vulture V at 23,300 ft (7,102 m). Bristol Centaurus C.E.4S radial 2,210 hp (1,648 kW) engine. Four 20 mm Hispano cannons (P5224, HG641). 1. Francis K. Mason. Hawker Aircraft Since 1920. Annapolis, Maryland: Naval Institute Press, 1991. 311. 2. William Green. Famous Fighters of the Second World War. Garden City, New York: Doubleday, 1967. 100. 4. Francis K. Mason. Aircraft in Profile, Volume 4. Surrey, England; Profile Publications Ltd., 1968. 4. Created May 21, 2011. Updated October 20, 2013.